Heaven Opens: The Trinitarian Mysticism of Adrienne von Speyr, my book is available. “Sutton’s deep penetration into Adrienne’s mystical gifts offers an excellent introduction to her unique vision and also helps hit the ‘reveal codes’ button for von Balthasar’s theology.” - Rev. Raymond Gawronski, S.J. I don’t write here to sell books, but do share what I create in my writing and teaching. My newest book captures the foundation of my theological and spiritual work as I develop the profound mysticism of Adrienne von Speyr. You can find out more about it here. If you’ve read my book, would you please considering sharing it with others by reviewing it in journals or online? All your help sharing my book gives me support to work on the next book, which will be available soon. I can’t wait to share this new one with you. Please read and share my book. You can find it in print and as an ebook. Thank you for caring to share these ideas. "The central thesis of the book is that the fulfilled mission of the Son opens heaven “to the Trinity and reveals the original image of the eternal, immanent relations of triune love”. 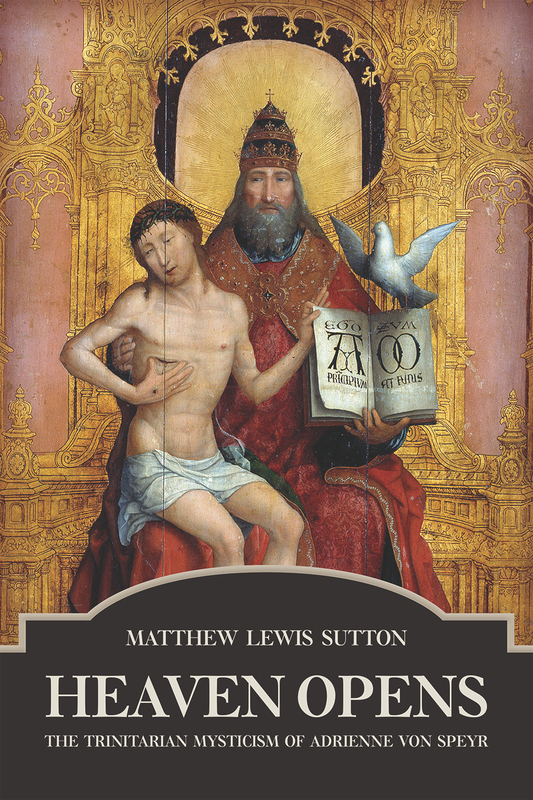 Given that the bulk of von Speyr’s work is untranslated, Sutton’s study of the German and French renders a great service to the church and the academy in English-speaking contexts. ... Von Speyr needs an apologist capable of accounting for her analogical imagination if her trinitarian theology is to be taken more seriously today. ... Sutton may be poised to deliver an account." Buy my book on amazon or learn more here. "Your Son, Father, let himself be sent beyond his death on the Cross into hell, into that most abandoned, most desolate region in which no living man has ever set foot. He did this in order to share better in all your mysteries, in order to show you that he is never complacent in your service, in his love for you. He offered you the "extra" by going even farther with his descent into hell. Father, since we know what your Son suffered and endured for our sake out of love for you, let us prove ourselves grateful for it. Moved by the same love that you give to your Son in the Holy Spirit, let us attempt to offer to you and to him everything we do and suffer, hope for and love, in a manner pleasing to you. Do not let the grace of your Son be wasted on us. Let our answering Yes resound with such ringing finality that you can accept it as an irrevocably valid word. You can really hear it as such, because the overflowing love and grace of your Son that are bestowed upon us guarantee that his own powerlessness to go on will be inserted where our feeble powers fail, in order thereby to round out our mere attempt to an actual accomplishment, indeed, to his accomplishment, which he presents to you, to your eternal light, through his descent into darkness." Available now from Catholic University of America Press is the new book project from Michele Schumacher, a private docent at the University of Fribourg, Switzerland. Her book, A Trinitarian Anthropology: Adrienne von Speyr and Hans Urs von Balthasar in Dialogue with Thomas Aquinas will have much to contribute to von Speyr and Balthasar studies. I've always enjoyed her work like Women in Christ: Toward a New Feminism and I know you will too when you are able to read this important new book. You will find it on amazon. Congratulations to Michele for this magisterial work! Recently I visited the Adrienne von Speyr House (Maison de Adrienne) in Paris, France. It is one of the homes of the ecclesial movement Points-Coeur or in the English Heart's Home. Founded over twenty years ago by Fr. Thierry de Roucy, they desire to be the presence of Mary at the foot of the Cross. They have several houses throughout the world serving the poorest of the poor in such countries as Chile, Thailand, Ukraine, Brazil, and India, but also they are in richer countries where the poverty of loneliness is extreme like in Japan, United States, Italy, and France. Having taken on the name of Adrienne, this house in Paris serves as a spiritual home for a community of young professional women who after university are often left without a community of friends in faith. They gather for sharing in the riches of the culture of compassion through prayer and fellowship. Immersed in heaven, living in the world, and lead by the motherly prayer of Sr. Isabel, who is a Servant of God's Presence, they gave living water to this thirsty American in Paris with their Cercle Adrienne-von-Speyr. They read Adrienne. They pray Adrienne. They are Adrienne. In my professional writing I often I will refer to Adrienne von Speyr as ‘von Speyr.’ Even though she took the surnames of her first (Dürr) and second (von Kaegi) husbands, she was published under her maiden name. While it is also common to use her name Adrienne, I choose to use the more common, English academic practice of using her surname. On pronoucing her last name “Speyr,” one can say “spair”, “spire”, or “schpair” depending on which language one is speaking, be it English, German, or Swiss, respectively. I tend to use the Swiss style "schpair". In my personal or informal writings, I refer to her as Adrienne. The Community of St. John chose to use first names with the personal pronoun du. My new book Heaven Opens: The Trinitarian Mysticism of Adrienne von Speyr is available today. It's available as a Paperback from Fortress Press and Amazon and also available as a Kindle or iBooks. However you choose to read it, please write a review to let others know what you think. Please let me know too. May Adrienne pray for us. We are two weeks before my book ships. I believe so strongly in this book and its impact for the scholarly and spiritual study of Adrienne von Speyr and Hans Urs von Balthasar. If you haven't preordered, please do so. You will be supporting me certainly (a good thing, I hope), but also supporting your further growth in deepening your faith in what our Lord has revealed to us in Jesus Christ. Please preorder Heaven Opens: The Trinitarian Mysticism of Adrienne von Speyr. Lord, we thank you for the gift of confession, for having taken away all our sins by your death. When you did this, you showed us how total nakedness before the Father, how standing ready before him, doing his will, remaining where he has placed us all belong to the essence of true confession. And now, as we come to the end of this year, we are conscious of having often done wrong. We have neglected so many things that, in keeping with your will, we ought to have attacked with gusto. We have not paid enough attention to your voice, we have not truly lived for you alone. For we should have sought you in all things, we should have relished the year's joys as coming from you, we ought to have taken on ourselves its sufferings as willed or permitted by you, we ought to have followed every path you opened to us. And yet there is no need to look back dolefully on this year, for like every year it was a year of your grace. A year in which you helped us, ceaselessly encouraged us, and showered us with joys and an endless number of good gifts. And if we have not discovered you in all things and have failed so often to meet your expectations, today your grace permits us to have the refuse cleared away from us. You cleanse, you mend, you make all things new in us and together with us. And you do all this by the power of your Cross. You suffered this Cross on Good Friday, and, in spite of our denial, you made so many feasts of redemption come after it on the strength of your Resurrection. And the absolution you give us is a perfect one: you give us the gift of a new purity, in union with the Father in your common Holy Spirit, in the eternal purity of the Trinity. And so we do not have to keep building on an imperfect and unstable basis but have the grace of a new beginning on the foundation of your own perfection, which you communicate to us. We have the grace to join in your work of construction, to walk, to hope, to labor at your side. This is how confession shines into our daily life, this is the effect of absolution. It irradiates and causes that joy which sprang first from your Cross and throughout all the days of the past year was enough to show us plainly your task. Therefore, we thai you for having done everything for us exactly as we needed, we thank the Father, who let you become man for our sake, we thank the Holy Spirit, whose constant effort has been to realize your mission in our existence. Amen. Now available for preorder: my new book Heaven Opens: The Trinitarian Mysticism of Adrienne von Speyr. Adrienne von Speyr was one of the most important mystical theologians of the last century, heralded by figures like John Paul II and T.S. Eliot. However, her work has been eclipsed in many ways by her personal connection to Catholic theologian Hans Urs von Balthasar. Heaven Opens provides one of the first comprehensive accounts of von Speyr's theology. My book argues that the eternal, immanent relations of the Triune God ground the mystical theological vision of von Speyr. Rooted in this vision of divine love, von Speyr's work is an account of the opening of heaven, a revelation of the Trinity's interior life turned outward to the world, that links intimately to the sacraments, prayer, the church, and the ethical life of obedience. In von Speyr's mystical theology, God as Triune journeys to us in order to brings us into the inner life of the Trinity. Here, von Speyr's work is for the first time given an independent hearing, expositing its content, features, and connections, and assessing its contribution to contemporary Catholic theology. Lord of omnipotence and lord of impotence, you reveal both at once in your holiness: your omnipotence, which can overcome and direct each one of us, and your impotence, which has to wait upon the love and surrender of each one of us. Whenever someone is ready to take the way that you yourself are and that you prepare for him, you place at his disposition your entire holiness as the light in which he can walk. Without this light that you provide, there would be no portal for him to find and no way before him. Without your light, none of those who believe in you would attain even a slight degree of holiness. For our holiness is the meeting of your light with the faith in us-- the faith we have always received from your light in the first place. And you allow us to reflect its beams together with you. In the midst of the city, you have set up the sign of your Son's Cross as the sign of the highest holiness. And when you let your people walk the way of holiness, you give them, in the mode and manner that pleases you, this Cross for the journey, so that they may accept it, bear it, and bring it back to you, the almighty God, in your Son's company. You allow your Son, accompanied by your saints, to give back the Cross he bore, but you also receive it jointly with the Son, so that he may see that you, Father, recognize in every one of your servants the countenance and the work of your Son. You have given these servants the gift of holiness that you Son won for them on the Cross. In order that he may learn in perfect love for you that you have accepted his perfect offer, you allow the imprint of the Cross to be seen in the sacrifice your saints only attempt to after you. All of us who have received from John the message of the perfect city want to serve you with renewed love, with renewed faith and renewed hope. We all want to use all our failing strength to help in the realization of your Son's work, so that his glorification of you, Father, may be manifested also in us and in all who are entrusted to us in your whole Church. Amen. Lord, so often I have given you what I possessed in abundance; let me now offer you everything that I do not have, that has always been denied me, that I have sought half-suspecting it was unattainable: peace, rest, shelter. And if I know now that all this belongs to you, that it remains in your safekeeping and is your possession, I will no longer clamor for it. The constant, vain running of my restlessness no longer troubles me: rest is in you, you have taken possession of it, even from me; you can dispense it again without loss; in you is shelter-- who else would have it?-- you can deal out this gift. Be praised: what we seek is found in you, and what we fancied we were giving you generously was in you from the beginning. And yet we thank you that in spite of this you accept it from us as well. Lord, do not just take what we do not have: keep it. Planting is the Lord's alone, to us he might leave the gathering of a few ears of his sprouting seed; that which was already his is what we bring before him. A living fire does not cease to burn until all is consumed and reduced to ash; no one regards the ash; strewn lifeless on the ground, it cannot fructify, hidden as it is, but it can be trampled completely into the earth, serving a task of which it knows nothing. Lord, burn us to ash, and scatter us according to your will. If I should ever say again what I will, do not grant that prayer: believe, even against every appearance, that from now on I am yours alone and know no other will than yours. Amen. Lord, in your Passion your glory disappears more and more; as the Son of man, you become pure man, so infinitely like us in your misery and nakedness. And if we contemplate these things-- whenever you grant us to behold them in truth-- we remain before them as if out of time, and what we experience is terrifying in its duration, but even more terrifying because of its content. All that we are enters this state of being only man, which is solitude, yes, abandonment. You suffered for us immersed so deeply in the night that we no longer even know that there is a Resurrection. Lord, the burden of our sins on your shoulders is becoming unbearable to us. Design the way, give it the form you wish, the form of a cross, if need be. Amen. Father, let our whole life become a prayer that rises up to you like fire and sweeps along in its flame everything evil and impure, all that belongs to us and to others, so that you may fill it up with your Spirit and may make it good enough to become yours and to be used by you. Do not leave the evil in us either, Lord, but turn it back; open us to your action, even when it is painful; allow our conversion, allow it in your own name. Amen. Lord, set me free and take me to yourself. You have shown me the chains that hold me back from my way, and if they still exist to hinder me, it is for no other reason than that in my heart of hearts I am not yet willing to detach myself from them. How often I moan and groan and regret having so little freedom, whereas all I really mean are the obligations that daily life and my profession entail; but these obligations do not really block my path, they do not affect its essential course, at most its outer form; if anything, they are perhaps just little tests. What weighs so heavily does not come from outside; it lives and takes shape in my own self-- I mean everything to which I am attached, which I am not disposed to renounce, which serves me as a crutch and a convenience, everything to which I believe I have a right. Take, Lord--I am trying to ask you for this sincerely-- everything that in my eyes is part of my rightful spiritual property, but that paralyzes my love for you, that makes your love for my neighbor stop flowing and freeze solid. Let me disappear in the flow of your love to all men, so that it can pour itself out unhindered. Amen. We can understand death and sickness and even poverty, Lord; but how can anyone turn away from you after having known your grace? That is an unfathomable mystery to us. After all, it would be quite easy for you to make the signs of your grace so obvious that no one could have any more doubts about them or to bring back those who are leaving with a gentle call: and you do not do it, in your wisdom, you do not do it. Lord, allow us just the same to beg you with our whole soul that our cry might pierce through the lukewarmness of those who are drawing back; let our members suffer for them, accept every sacrifice for them, only, we implore you, enable them to return, make it easy for them, and in exchange let us pay the price that you deem just. We will try to give you what you take, but grant them anew your faith, your grace. And at the same time we know that we ourselves take our faith too lightly and are given over and over again to promises that seem hard when it comes time to keep them. Lord, grant us all your mercy and strengthen our weakness. Amen. Lord our God, give your children ready perseverance in loving you. You know all too well what we are like: moved by your goodness when it comes to us unexpectedly, dismayed by your severity when it reveals itself to us with its demands. When we live through happy or hard days, we think of you, seeing what comes from you; but in the monotony of every day we grow lukewarm, we forget you, we keep you far from our thoughts and from our action, as if we needed you only on the eventful days, as if we wanted to have you at our disposal. We beg you, change this, let us turn back while there is time, act decisively, tear out our tepidity, replace it with fire or cold or with both at once, only, allow your Spirit to blow in us. Destroy everything that is not yours, and let us think no thought whose center is not you, so that by this destruction we are compelled to a livelier love. We do not demand of this love that it be painful or delightful, only that it be yours, forevermore. Lord, give us the grace to offer you again and again what you have given us. Only in this way will we unprofitable servants not remain fruitless. Bless your love in us, so that it may yield the fruits that you desire. Amen.